There is a common view by some that if you want to show how smart you are you should tell people how complex your investment process is relative to others. Wow investors with your skill and mental dexterity and this will win you new money. Be and act like the smartest man in the room. Yet, in reality, there is elegance in simplicity and the ability to breakdown processes into simple language. Complexity may make a manager seem smart but it may not raise assets. Investors will never give money to manager they cannot understand no matter how smart you are. Simplicity may actually show your true skill. As said by Albert Einstein, "If you cannot explain it to a six year old, you don't understand it yourself." This need for simplicity is certainty true with investor due diligence. Investors do not want to pick the most complex investment process but one that makes sense and is simple to understand. Of course, there is desire for uniqueness and special skills, but the need for simplicity still exists. Hence, one of the key roles of managers is to conquer complexity through providing simple answers to the key questions. 1. What do you do differently than other managers? 2. What is your edge? Why or how do you do this differently than others? 3. How will you perform during periods when your peers do poorly? Why? 4. How will you perform during periods when your peers do well? Why? 5. Why should investors have your strategy in their portfolio? Surprisingly, these questions are not easy to answer and take a lot of work to effectively explain to investors; nevertheless, driving to simplicity not only helps the investors but also the manager. "What is your Sharpe?" This is one of the first questions that is always asked of managers. The mangers will firmly reply, "My Sharpe ratio is X." The conversation then moves onto the next question as if this one number serves to address the performance issue, yet the Sharpe ratio is dynamic. In a drawdown, no one wants to even see that number. When things are going well, the Sharpe ratio is king. Investors have to accept that this is a variable number because the underlying assets bought by funds have variable Sharpe ratios. Investors may know that the Sharpe ratio for asset classes change, but research also shows that it is associated with swings in the business cycle. Most long-only managers will likely see their ratio ebb and flow with the business cycle. Hedge fund managers should see the same swings. Now a dynamic Sharpe ratio may seem obvious. Returns fall and if fund volatility stays the same, the ratio will decline. What is more interesting is that the ratio is sensitive to changes in well-defined factors. Hence, the Sharpe ratio is predictable. This is the conclusion of some older work by Yi Tang and Robert Whitelaw, "Time-varying Sharpe Ratios and Market Timing". They find that the Sharpe is very business cycle dependent with lows at the peak an highs at the trough. The Sharpe is predictable through tracking some macro variables. We bring this issue to your attention because if there is a decline in the Sharpe ratio for equities, it will generally spill-over to asset managers and make it harder for them to achieve a high Sharpe ratio. This will be especially the case for mangers who are long-only or don't diversify across many asset classes. Global macro managers who trade across asset classes are more likely to have Sharpe ratios that have the potential to weather this effect. As important, the research suggests that the Sharpe ratio for asset managers can be improved through market timing. Hence, macro managers who can time exposure to equities using simple models can improve their Sharpe ratio versus a constant equity exposure. Liquidity is never present when you need it. This truism is especially the case when there is a financial crisis. 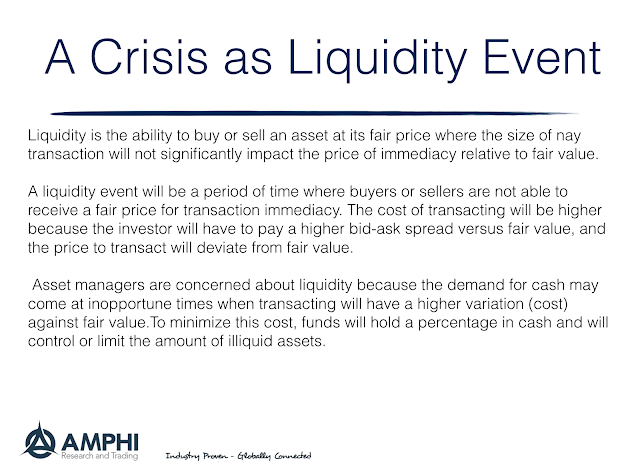 A crisis become a liquidity event if sellers cannot find buyers at a fair price or at extreme any price. If the security is more specialized or complex, it will be even harder for the seller to find buyers. There will have to be a greater price decline from fair value before a buyer is found. 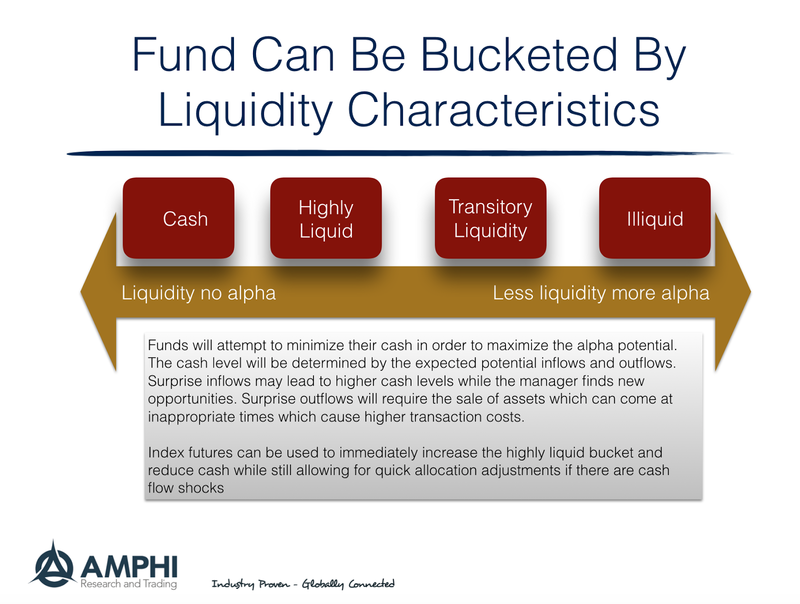 For a fund, if there is a crisis event where there is a demand for cash and significant redemptions, the fund manager will have to sell perhaps illiquid securities to generate cash in a hurry. There will be a discount for these illiquid securities that the remaining holders in the fund will have to face. A manager can avoid selling the illiquid securities but this changes the composition of the portfolio that again will harm the remaining shareholder. The more liquid assets are sold first and the remaining shareholders are left with a more illiquid portfolio. 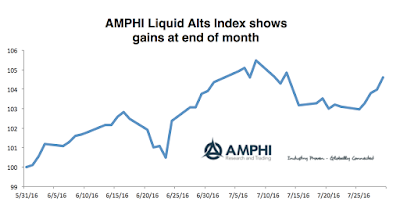 A portfolio can be thought of as a set of liquidity buckets or a liquidity ladder. If the liquid assets are only sold, there will be an imbalance for the remainder of the portfolio. To stop the potential of a liquidity run, a manager may create a gate on redemption. Certainly regulators are more aware of these problems given the focus on bucketing the liquidity of funds and requiring restrictions on the amount of illiquid assets. Nevertheless, funds have to find a strategy that works best at maintaining liquidity. Given a simple framework there are specific actions that can be taken to mitigate some of the risks of a liquidity event. The portfolio can be bucketed into liquidity categories and liquid asset such as index futures can be used to adjust the portfolio risks for short-term shocks. 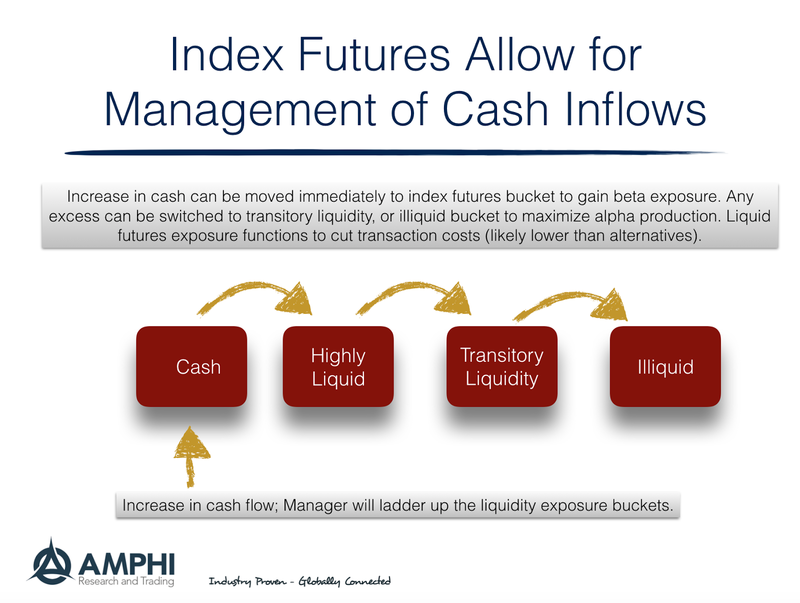 A surprise inflow can be immediately invested in futures to generate beta exposure. If there is a shock outflow, index futures can be used as means of holding liquid assets that can be sold quickly. 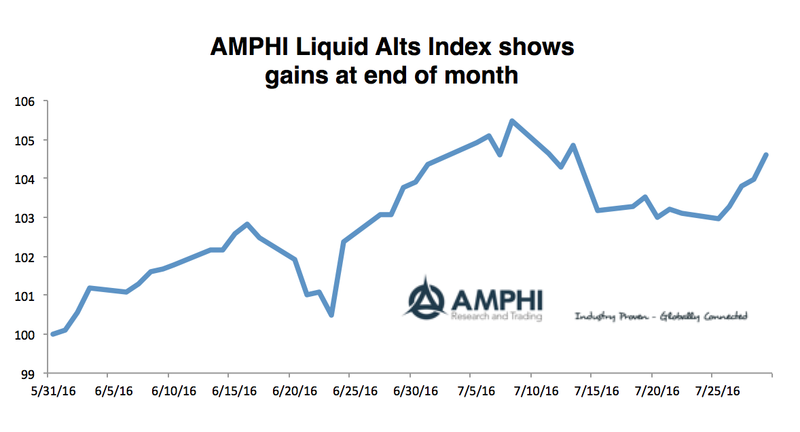 Index futures may not solve a crisis event, but it can be used as liquid stop-gap for short-term liquidity needs. History does not disclose its alternatives. Investors do not know the impact of different alternatives in history. In fact, history is subject to discovery and this process of historical discovery is subject to biases as we try to sift through facts. Central bankers tell us the economy would have been far worse without the various QE policies, but we do not know for sure. We only have the path that was taken. 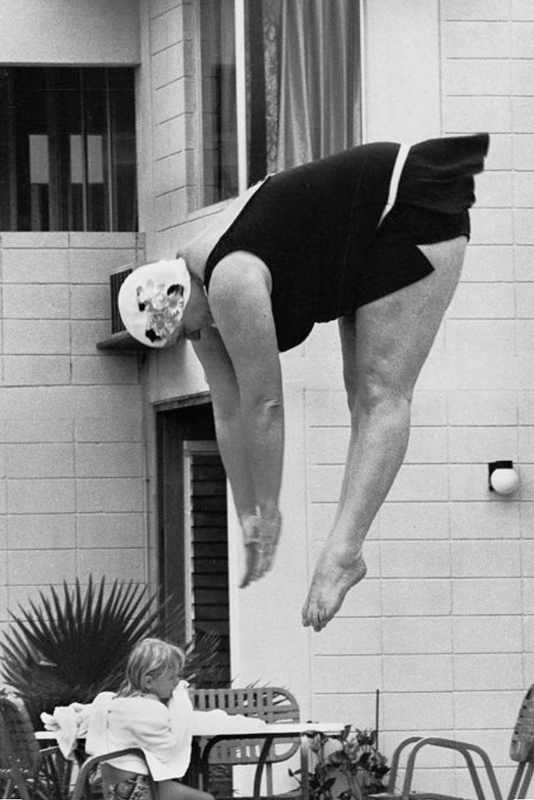 Counterfactuals are a poor way of measuring success or failure. Econometric models can simulate different scenarios for a policy change or shock, but if the policy is truly new, this is all guess work. We do not know for sure what will be the reaction of market participants. 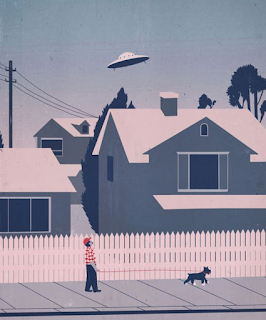 Investors have to weigh alternatives and conduct the what-ifs scenarios in an uncertain world. In fact, the more uncertainty, the more scenarios have to be run. History will not be enough because price or performance time series are just one path for a given distribution of return and risk. The past tells us one path of market behavior which may not be repeated again. 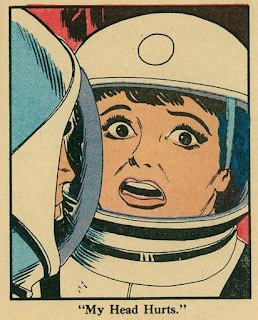 We expect otherwise, but the assumption, in an uncertain world, is that more what-ifs are necessary. This lack of knowledge of potential behavior is especially the case with analyzing managers. If we simulate returns for two managers with the same distribution we will not get the same path of performance. 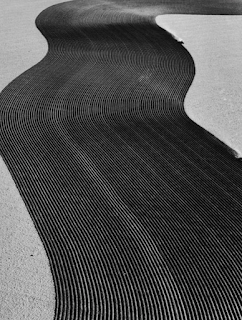 We know what will happen if there are many paths generated, but there is potential variation with any given path from a single distribution. 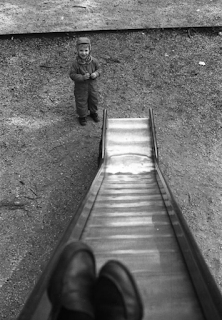 So what can an investor do to minimize risks? Force discussion of alternative scenarios with managers. The process of thinking through alternatives is critical to understand what could be the potential risk of some policy or market shock. For the systematic modeler, this means looking at a lot of history and decomposing shocks to see not what is the average impact but what could be the potential extremes. There is value looking at outliers. Lower rated bonds are extremely risky and are really not fixed income instruments at all; they are best described as “equities in disguise” or “equities with a coupon.” In fact, these bonds always end up trading at equity‐like yields (which translates into much lower prices and very high yields) when the market recognizes their subordinated, equity‐like character. The post-Recession mantra for investors in a low interest rate world has been to reach for yield as a offset for near-zero rates. The Fed implicitly wants investors to take on portfolio risk as a means of jump-starting investments, but unfortunately, reality is not so simple. Reaching for yield is thought by many as just obtaining more spread over Treasuries or yield from shorter-term maturities. The risk of grabbing for yield is just not that simple as described by Michael Lewitt, a long-time credit specialist. For lower-rated high yield investments, there is more equity-like risk which is not the same as buying high quality companies. While high yield as measured by the HYG ETF seems to be doing well in 2016, a longer time period tells a different story. Holding the high yield index would have been a loser for the last three years. In fact, the underperformance would have been the case for a five year and ten year holding period. Greater yield is not the same as higher return, and greater yield will not lead to higher return. 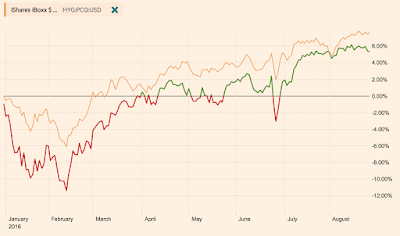 The graphs comparing the HYG ETF (in beige) and the S&P 500 index (in green and red) tell the real story. Evidence-based finance can be viewed as a subset of quantitative investing. While the pure quant will develop models and do all of his own testing, an evidence-based manager may use other information to drive the process. The evidence-based manager will scour as many sources for information of some relationship and use the work of others to serve as a prior for forming an idea or make a decision. Inherently bayesian, evidence-based decision-making weighs all of the prior evidence to derive an opinion on a decision rule. Actual new testing will be used to further support these priors from others. Evidence-based decision-making is being used extensively in medicine and is used more often than admitted by many in finance. 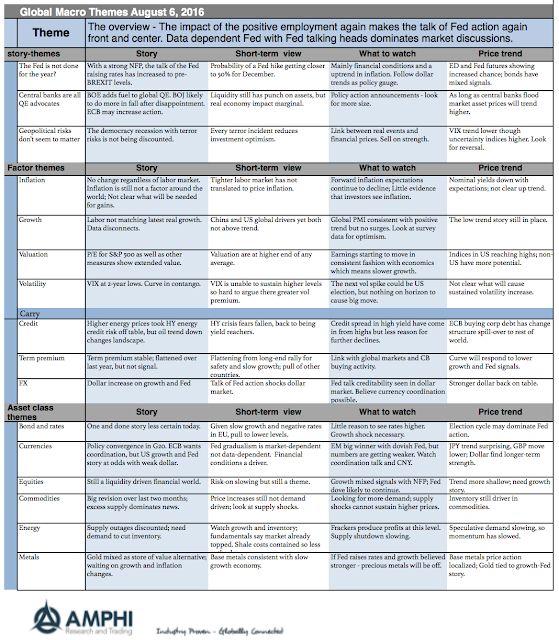 The key to good evidence-based decision-making is effectively weighing different evidence based on the quality of the tests and the analysis that is used. Now many quants will review the literature before they undertake their own tests, but evidence-based decision-making is more than just a simple review of past tests. It is means of weighing the work of others. Adjust the decision rule or eliminate. This approach may be viewed as simple but the value is in forming a defined research structure that can stand up to testing and a weighing process. There has been much discussion on the impact of institutions and indexing on commodity markets. Most of the press has been negative. Large institutional non-hedgers are believed to have distorted prices and increased the correlation with other asset class. The empirical research on this topic has been mixed. While some have shown an impact from institutional usage, there are many studies that show no impact. The question has not been answered and more data may not provide the answer. 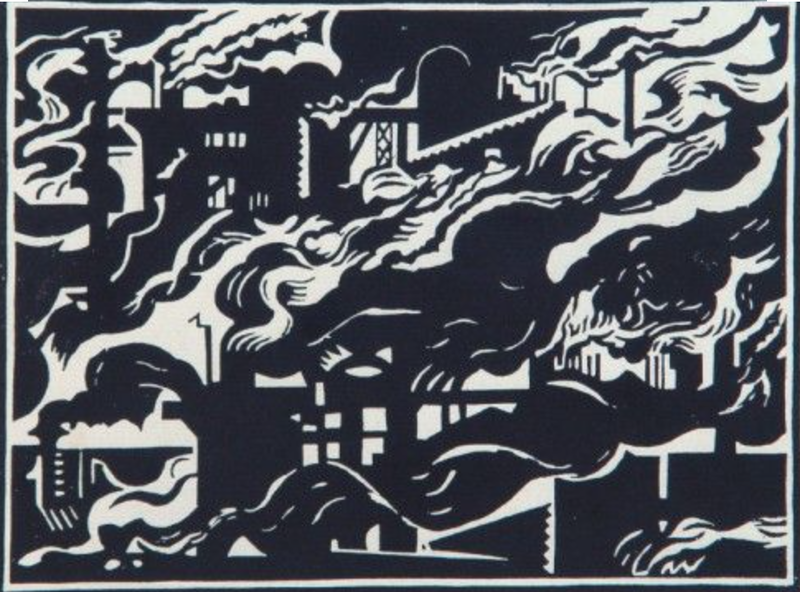 Two researchers took a different approach to the problem by building a theory around the financialization of commodities. While there is no substitute for empirical work on the issue, their model in the Journal of Finance, "A Model of Financialization of Commodities", serves as a useful framework for discussion. There approach is similar to work done on index behavior in equity markets and uses a stochastic discount rate model to provide the foundation for their work. When institutions care about performance relative to a commodity index and use a discount rate relevant for their risks, there will be an increase in prices, volatility, and correlations for all commodities but especially of indexed commodities. Similarly, the equity-commodity correlation will also increase. The presence of institutions creates a link whereby financial shocks are transmitted to commodity markets. Institutions who invest in commodity indices reduce the market segmentation that previously existed between commodities and other markets by discounting risk uniformly. So what? This is just theory. It is important because it tells us what many have felt in market behavior. there is a link between financial shocks that spill-over to commodities. Commodity traders who prided themselves on being experts in their markets now need to also focus on shocks that could affect the wealth of institutional players. If risk in financial markets change such as with the VIXX volatility index, there will be a carry-over to commodities and there will be a differential between the impact on index commodities and those that are not in an index. Investors like big hedge funds. They offer better infrastructure and usually are able to better meet operational due diligence standards. Big funds will have better client service. But bigger funds will miss on the essence for their existence - performance. Hedge funds show diseconomies of scale and investors chase winners. This has been well-documented with mutual funds, but with incentive fees the expectation is that diseconomies of scale would not be an issue. In fact. size does matter and not for the better. 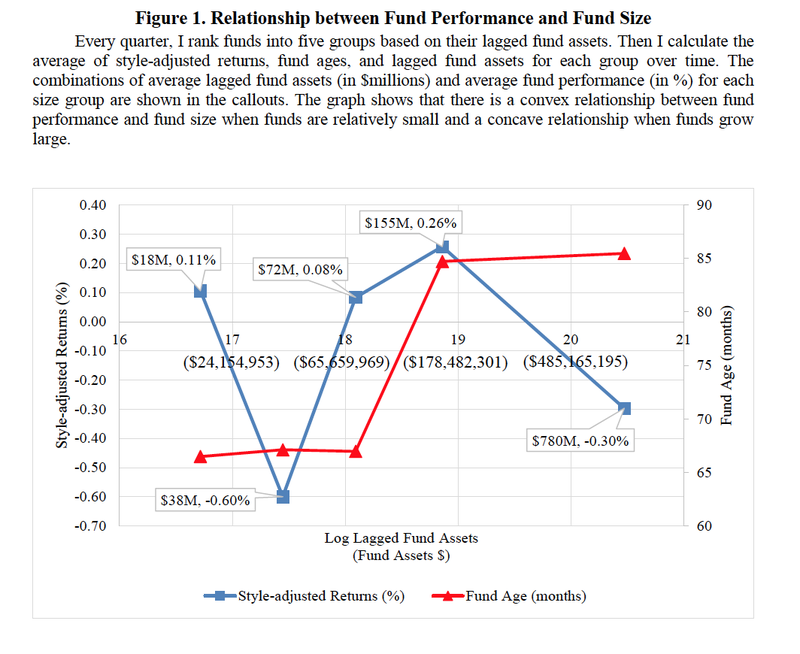 A recent paper that explores the optimal size issue was published in the Journal of Finance, "The Optimal Size of Hedge Funds: Conflict between Investors and Fund Managers", by ChengdongYin. It extends work that we have highlighted on the money management and incentives. (See "Competitive Asset Management and Why Focus on Less Popular Managers".) The simple fact is that there are incentives for managers to size their funds based on their fee arrangements. High management fees relative to incentive fees will have managers push for growth even if it negatively affects performance. The current combination of management fees and incentive fees for hedge funds does not solve this problem. Yin's research shows that the diseconomies of scale vary by investment style. Some styles have more diseconomies than others. For example, emerging markets, global macro, managed futures, and long/short equites all show diseconomies. Managers will continue to grow until that push their returns down to the style averages. Be with the crowd and then just collect your fees. The diversification of the manager is no help. This provides an incentive to grow one fund until you get the diseconomies and then start another to repeat the process. The message is the same as with mutual funds. If you want to find the exceptional managers, go small and when the manager grows to a certain size, sell, and repeat the process. This takes work be the number suggest that there is potential reward. Can you make money in commodities? Can you make money in commodities? Some will say no if you cannot get the roll or income carry working for you. A recent paper in the Financial Analyst Journal "Conquering Misconceptions about Commodity Futures Investing" describes the abject failure of commodity index investing over the last decade. Billions may have been lost by investors that bought a commodity index basket as a inflation hedge or a form of asset class investment. This was based on a correlation with inflation that was not very strong and on the believe that the roll yield from backwardation would always exist. There was the turn in the commodity super-cycle that worked against investors but the real investment widow-maker in commodities was the failure to properly account for the significant shift to contango from backwardation. If demand declines and inventories are high, the contango will be a significant drag on returns. 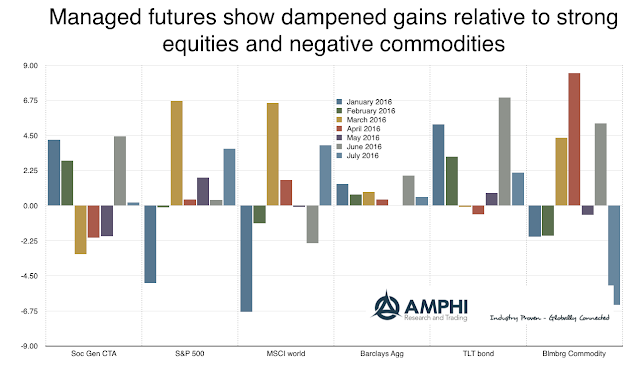 The test period that got most investors excited about commodity investing was a period of strong backawardation so that investors through they would be receiving a positive risk premium from the roll of futures. The carry in commodities is time varying and not a given. The commodity income was a key driver for returns over the long-run. Because investment in commodities is through futures, this carry component is critical to successful investing. Knowing future commodity prices has not been as important and knowing the roll in the futures markets. The backwardation is a more consistent driver of returns. 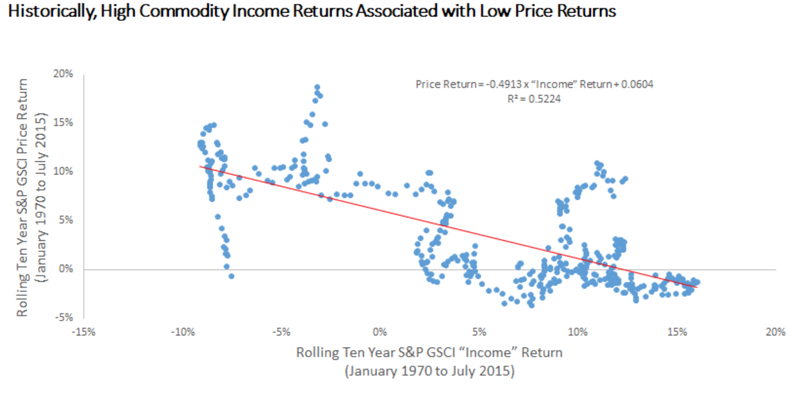 The backwardation is associated with low commodity prices. Income will be high from roll when price returns are low. The high prices at the peak of the super-cycle were also a time when income returns would be low. The research says to forget about trying to come up with a forecast about commodity prices. It is more relevant to think about the shape of futures curve as a key driver of performance. What separates global macro from other hedge fund styles. It could be its wide ranging diversification across all asset classes or it could be something broader on how opportunities are found. The difference that makes global macro unique from others is what can be described in the German word, weltanschauug. Some would say that you could just use the words world view, but we think it is something deeper with how macro managers connect with opportunities. It is the philosophy that they bring to the market. Financial markets are all connected. 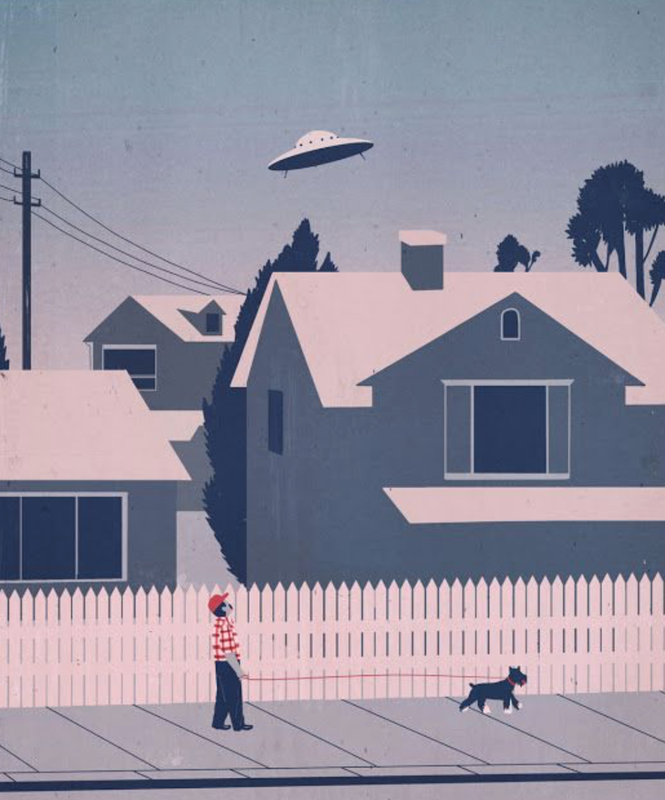 Asset classes should not be looked at isolation. Common factors (shocks) or risk premiums affect all markets, just differently. This connectivity is not perfect or immediate. Relative asset reaction is sometimes slow. The global macro manager thinks of the investment world as a whole. It is a general equilibrium view and not partial or localized to one asset class. Events in one market will spill-over to others, yet the cascade from one shock will have different speeds of adjustment. For example, falling oil prices will affect energy companies and will impact energy high yield bonds and the growth of oil importing and exporting companies. The are a host impacts which that have to work through the financial markets. One shock can affect many markets, but the impact or the realization of the potential impact will not happen all at the same time or with the same intensity. Markets can be out of equilibrium for reasons as simple as costs and liquidity or through behavior biases. Nevertheless, dislocations allow for opportunities for those who can better understand the linkages. There will be dislocations that will eventually need to be corrected. It is not that markets are inefficient, but rather there is some slack in the level of efficiency that may allow some to profit. Some like managed futures managers may find these connections and dislocations through trends in prices. Others can see them through comparison to past fundamentals. Still others may be able to tell complex stories and see linkages through detailed analysis. These are all variation of the core world view or weltanschauug that there is cross market connectedness that cane exploited. There are millions of shares traded with the VXX ETF and billions outstanding as investors have poured into this market as a "hedge" against equity price shocks. The ETF is supposed to follow the CBOE VIXX index, but it is actually an index of the front two VIXX futures contracts. As an index of the two futures contracts, if the futures price slope is downward (contango), the market will lose value as the component futures contracts of the index move closer to maturity. 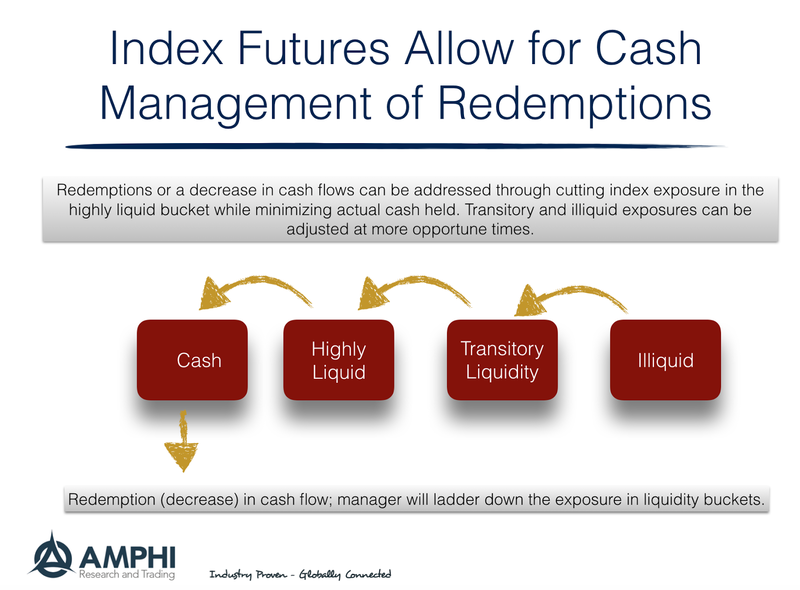 If the market is in backwardation, (upward sloped to the cash index), the index will gain in value as the futures approach the contract expiration. For those who have bought it and stuck it away in a portfolio, it has been a continual performance drain. I will not go into the many reasons for why this is the case other than to highlight the declining volatility since the Great Financial Crisis and the main contributor, the VIXX futures contango effect. Most of this is known, but the impact is especially highlighted when there is a reverse split that offsets the significant price decline from the relentless loses from the futures contango. VIXX futures has many uses and is a very interesting trading vehicle, but it is not a buy and hold hedge instrument. 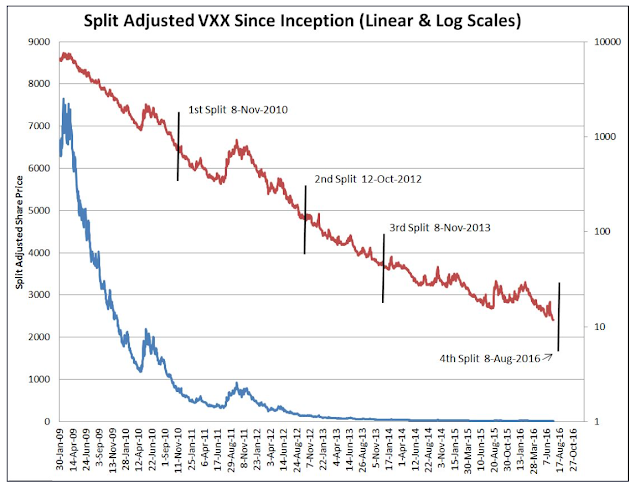 Investors should focus on the the purpose of holding the VXX as an investment in the first place. The main reason is to serve as an uncorrelated or negatively correlated asset relative to equities. In a case of a volatility spike, the VXX will gain while equities should decline as the market falls to give new investors compensation for holding a riskier asset. However, the index construction creates a performance drag, a time decay, if there is no volatility spike. The cost of this hedge is too high for a passive investor. If the objective of holding this investment is hedge diversification, there are other alternatives like bonds as a safe asset or managed futures which do not have the drag from VIXX futures contango. Granted the link between these alternatives may be different, but the portfolio effect will be similar without the performance drag. Most think that buying managed futures is the same as investing with trend-followers but that is not the case. All CTA's are not alike, but how many styles or classifications actually exist? It could be argued that managed futures and global macro are two of the most diverse hedge fund strategies that exist. 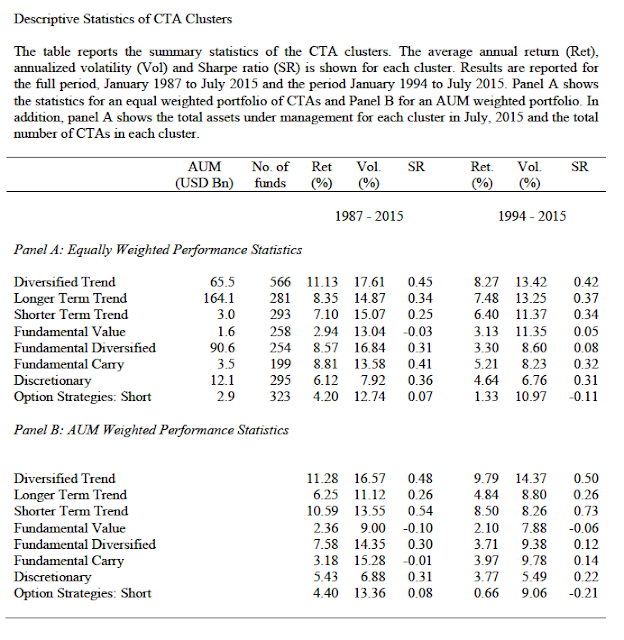 In contrast, merger arbitrage or long/short equity are fairly well defined. There can be wide differences in performance but the foundation of the category is fairly clear. This is not the case with managed futures. CTA's can trade a diversified set of markets or a single sector, a wide set of time frames, and styles that can run between trend-following to discretionary. One approach is develop definition and then place managers with these definition buckets, this is rather ad hoc. An alternative is to conduct a cluster analysis and find bundles of managers that have similar characteristics. 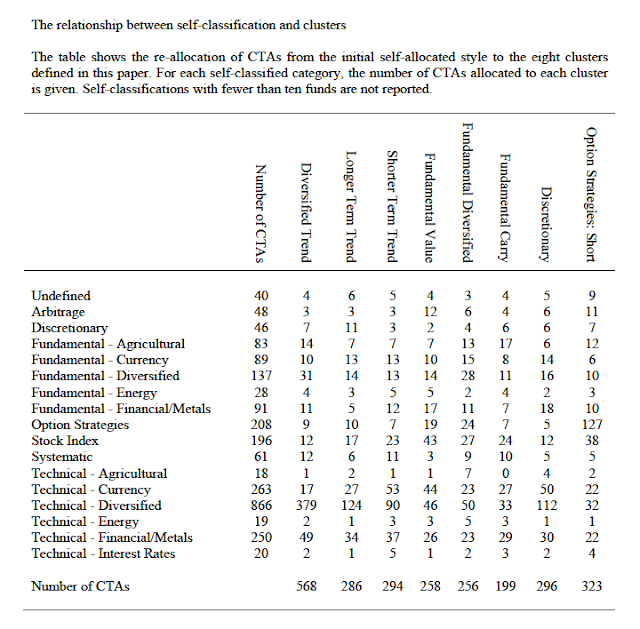 This cluster analysis was conducted by a set of researchers in Ireland over a long period on a large CTA database. (See "Just One Trick Pony? An Analysis of CTA Risk and Return" by Foran, Hutchinson, McCarthy and O'Brien.) They were able to identify eight different strategies with a broad set of CTA's. There are more than just trend-followers in the CTA space. The biggest category is diversified trend which is 23% of the total number of funds. Trend-following in all forms represents about 46% of the total. Based on AUM, long-term trend represents about 50% of the total and trend-following in all forms is about 70% of the total. Trend-followers dominate the AUM and other strategies are clustered with smaller managers. The diversification benefit with smaller managers occurs because the smaller managers are less likely to be trend-followers. When you look at performance in these clusters, you will find meaningful differences in return and risk. Overall, diversified trend is still the best strategy by return and information ratio on an equal weighted basis. 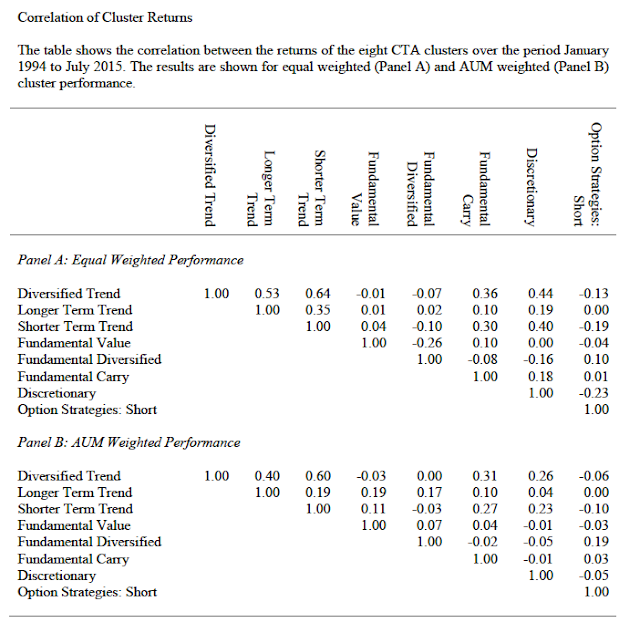 On an AUM basis, diversified trend is best but the short-term trend classification has the best Sharpe ratio. The non-trend-following classifications offer significant diversification but this may only be from their lower return profile. 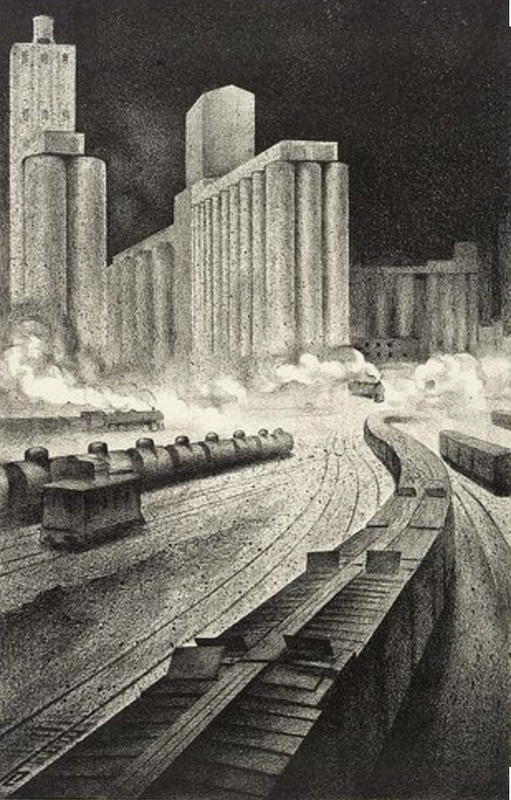 Trend-following gathers all of the assets because it seems to work. Default free - The Iceland and Ireland crises, the Greek debacle, and the downgrade of US Treasury in the developed world tell us that default risk is relevant even for governments in developed countries. Certainly, any faith in ratings is misplaced given the abject failure of rating agencies to adjust ratings in a timely fashion or to get them right in the first place. Stable yield - Stable yield is elusive. Short-term yields in the US are stable but near zero. If by stable yield, you mean a positive real yield, you can forget about it. Central banks have made it their policy "right" to drive real yields negative when they choose. Limited downside - Aside from the negative yield question, there is growing downside risk just because nominal yields are low by any measure of history. If monetary policy is effective and gets 2% inflation, there will be real loses. Compounding this effect is the extended duration of bonds in a low rate environment. There is more risk with bonds today than 10 years ago. Store of value - The search for safety in alternative currencies exposes investors to currency risk. They may pick a currency which is strong today but there are no guarantees that they will continue to be strong. 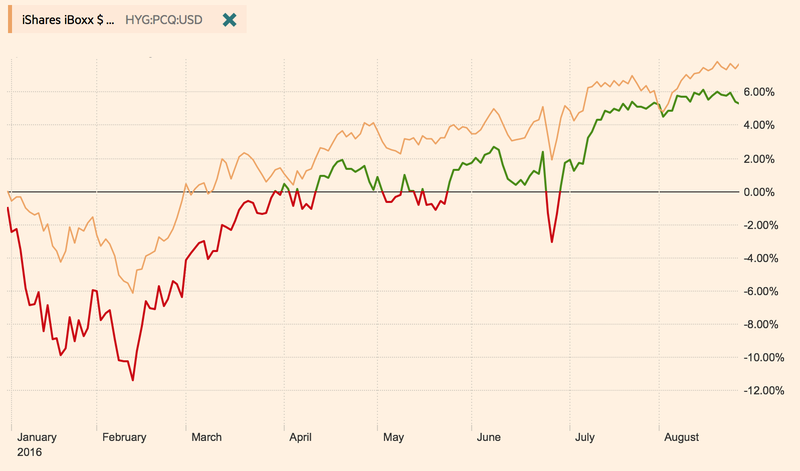 Safe stop of value currencies have seen their central banks try to reverse this strength. Perhaps the most prudent view is that there is nothing safe. A view of buy and hold for bonds is risky given the changing dynamics with credit risk. While there has been a consistent set of stories about the reach for yield, the real issue is the stretch for return. If a pension fund has to obtain a targeted rate of return, the question that has to be solved is the mix of assets that will get you to the target without taking more risk. Reaching for yield is not a solution. Stretching for returns creates a bigger problem. Many pensions still have expected returns of approximately 7.5% used as their targets for actuarial purposes. If the pension lowers the expected return, more funds will have to be committed to offset the actuarial shortfall. Twenty years ago, you could get your 7.5% return through just holding bonds. 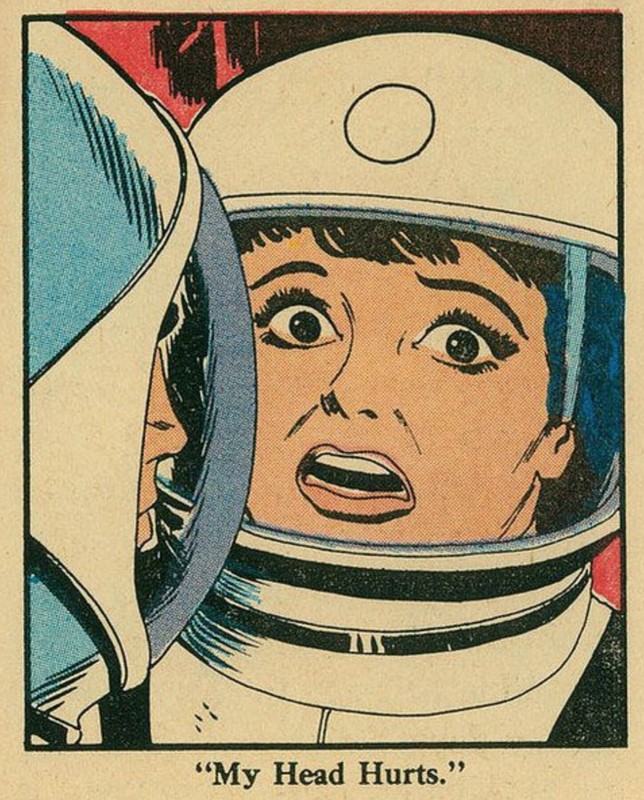 Your risk was limited. 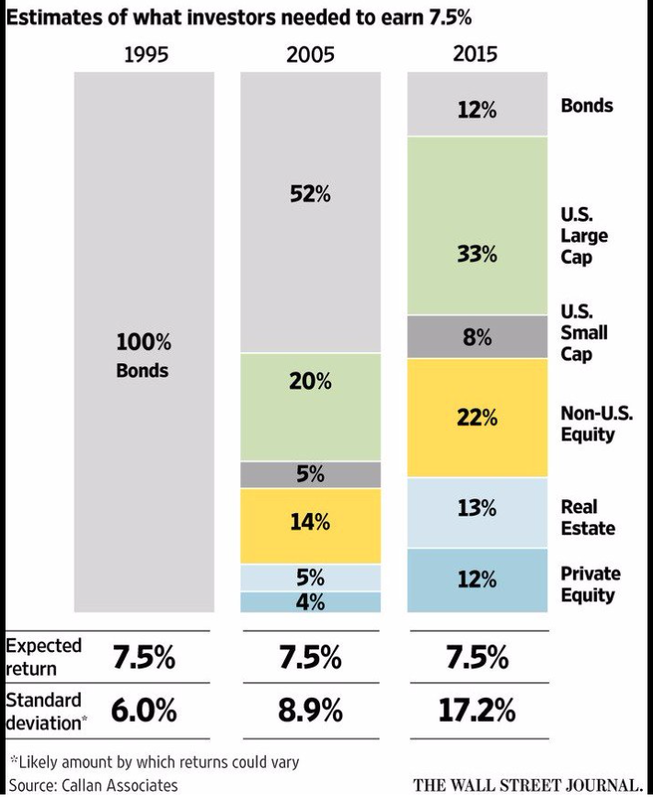 Today, the bond allocation would be only 12% using estimates from Callan Associates. Investors will have to hold a basket of riskier assets. The price that has to be paid for this return is a volatility that is almost three times greater than twenty years ago. For the same expected return, you have to lever the risk. Of course, there is upside with higher volatility, but a pension is less than one standard deviation away from double digit downside risk. 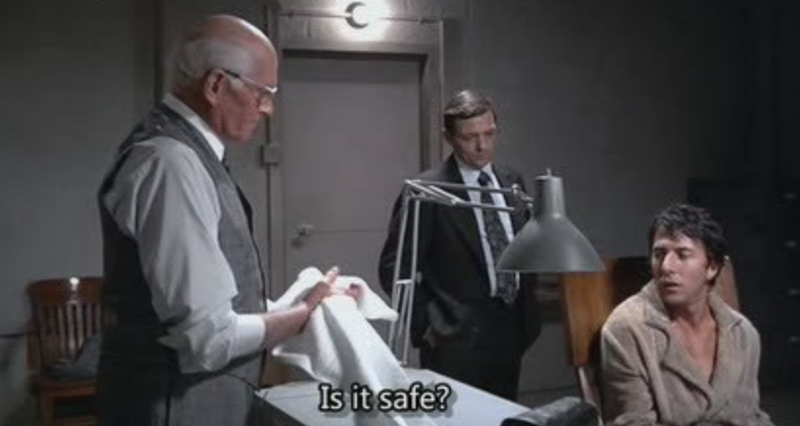 If there is one question that has to be posed to any hedge fund managers, it is simple. How can you get us out of this problem? How can you bend the risk-reward trade-off so we have a chance of hitting our target without taking undue risk? If you cannot provide a good answer or even appreciate the question, then you don't belong in a pension portfolio. The solution is not a glib answer to pander to the pension, but a thought response on how the manager's particular alpha or diversification will offer a better alternative than the asset class choices presented above. As we have commented in the past, the financial month really starts with the non-farm payroll numbers. This economic number sets the tone for the month with regard to Fed action or other economic announcements. A good number and Fed action is on the table. A poor number and the Fed is on hold. Similarly, economic announcements throughout the month will be gauged on whether it reinforces or contradicts the NFP number. Every number in August will be judged by whether it will make the Fed's labor market data dependency story stronger. Of course, we will have Chairman Yellen speak at the Jackson Hole conference later in the month, but we can expect that this will only add confusion as opposed to policy clarification. Our biggest concern is the complacency that seems to exist in the market action. With the VIX at such low levels, it seems as though markets don't care about the geopolitical and structural upheavals around the world. Acts of terror even if believed to be uncoordinated and through "lone wolves" should dampen investment optimism and should cause portfolio rebalancing. This should add to volatility. BREXIT, BOE rate reductions, ECB policy effectiveness, and BOJ uncertainty should all add to volatility, yet we are not seeing it in the markets. Even US presidential polls that bounce between, in many ways, flawed candidates has not created volatility. 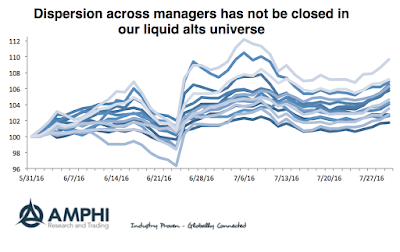 Perhaps with August vacations and the heat, there will be continued lethargy about portfolio rebalancing, but our read of the past is that markets will ask for a greater premium to global uncertainty. Sometimes it will take longer than expected by the smart money pessimists, but it will occur. Buying downside protection which is now cheap seems to be a strategy that should be given more consideration. 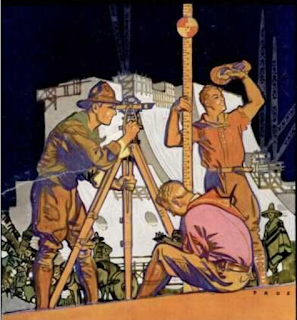 "[A] model will be a simplification and an idealization, and consequently a falsification. It is hoped that the features retained for discussion are those of greatest importance in the present state of knowledge." 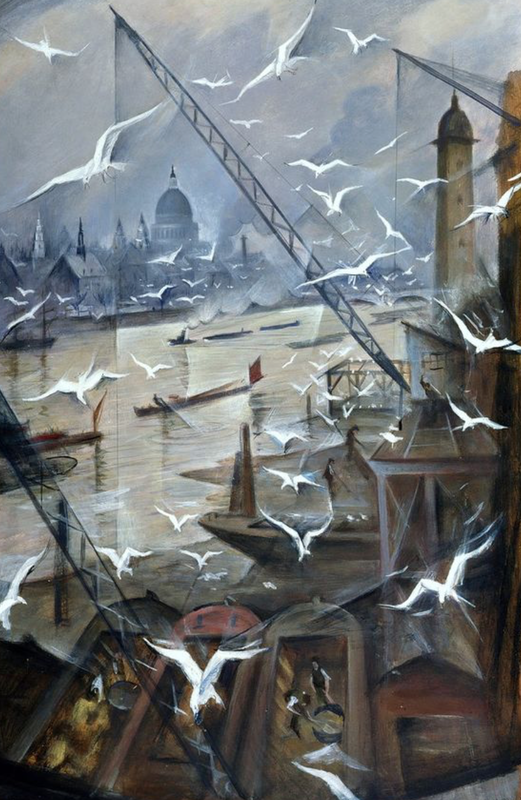 The real trouble with this world of ours is .. it looks just a little more mathematical and regular than it is; its exactitude is obvious, but its inexactitude is hidden; its wildness lies in wait. So what can be done about this problem with models and complexity? Keep it simple. This is not the same as simplistic. You just have to realize that for each extra factor there is greater potential for something to break. Data could be wrong. The relationships can change. On the other hand, if there are not enough factors, the model will to capture a key relationship. In keeping it simple, there is the realization that a model is only an approximation and that failure is real. We also like the construct of convergence and divergence effects to at least think about how the world operates. Markets are dynamic and move between converging to some equilibrium price or moving away from some equilibrium in response to some shock. There are market dislocations or divergences. These "shocks" are unanticipated and will have the greatest impact if they have not even been modeled or considered. An awareness of divergences is critical to understand models as falsifications or reality. Similarly, convergence suggests that dislocations in price will move back to fair value or to what may be considered equilibrium as structured or explained in a model.The world is still driven by some fundamentals relationships. An ebb and flow of divergence and convergence can frame why models in the short-run may not work but in the long-run may be effective representations. 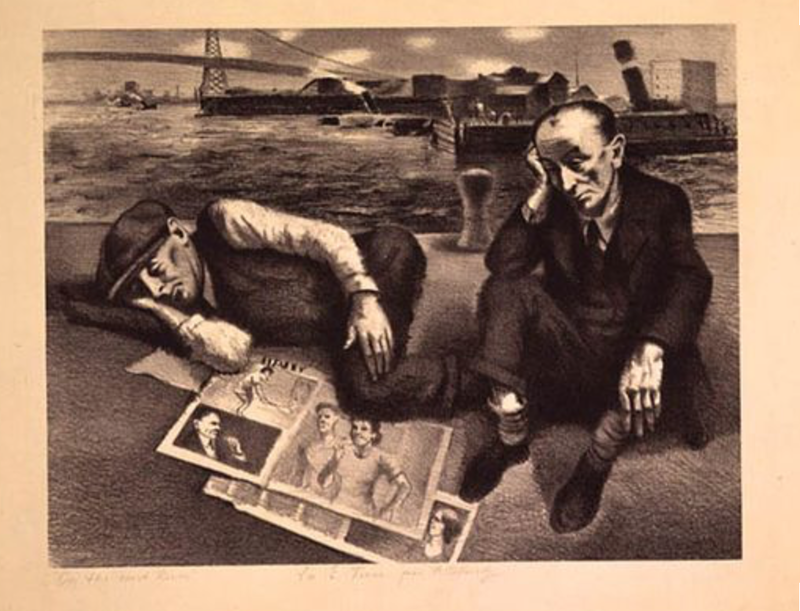 As Herb Stein said, "If something cannot go on forever, it will stop." The divergence of today may be the convergence of tomorrow. The model often cannot explain all divergences but may still be effective as stating that prices may move back to some norm. The truth is sometimes a poor competitor in the marketplace of ideas - complicated, unsatisfying, full of dilemmas, always vulnerable to misinterpretations and abuse. If you look for truth, you may find comfort in the end; if you look for comfort you will not get either comfort or truth, only .. wishful thinking to begin, and in the end, despair. Truth, you can't handle the truth! - Col Jessep, "A Few Good Men"
Listening to many politician, policy-makers, media talking heads, and market analysts, there seems to be a shortage of truth. 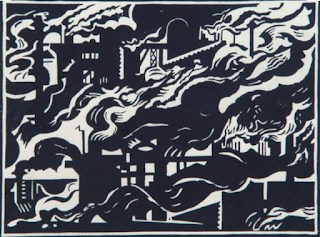 We are not actually saying that there are lies being told although that does occur rather there is more a willingness to present explanations or stories with a bias or an agenda that may not try to present alternative causes or explanations. In a world where there are shades of reality, some only use one color. This is an avoidance of presenting the whole truth. The truth is messy and often does not present what an audience wants to hear. The truth is often nuanced with alternative explanations fitting the facts. Truth on a simple level is just stating facts, but even stating facts without context avoids the truth. Truth as explanation is much harder yet they should be our goal. The search for truth can start with looking at prices. This is why the price is the best foundation for analysis. Prices do not lie. They may suspend with rationality, but at any time the price is willing to serve as a mechanism for allocation, as the level for transacting, and the aggregation of all weighted opinion good or bad, fully formed or not. You may not like the price. You may not agree with the price, but the price is where a market is willing to transact. By extension, models which use price and other data in some form of weighing scheme is truthful. The truth is not in the fact that the model will be a good forecast, but in the reality that it tells us past relationships between data. Models are truthful in that it can tell us the amount that can be explained. 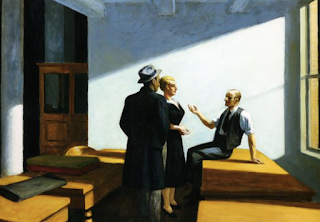 In essence, it can often tell us that our ability to explain the past is often very limited. Our interpretation of the model is what may be less truthful. Prices and models based on data are close to current reality and truth. They do not have to be right, but they should be an unbiased representation of what we know. 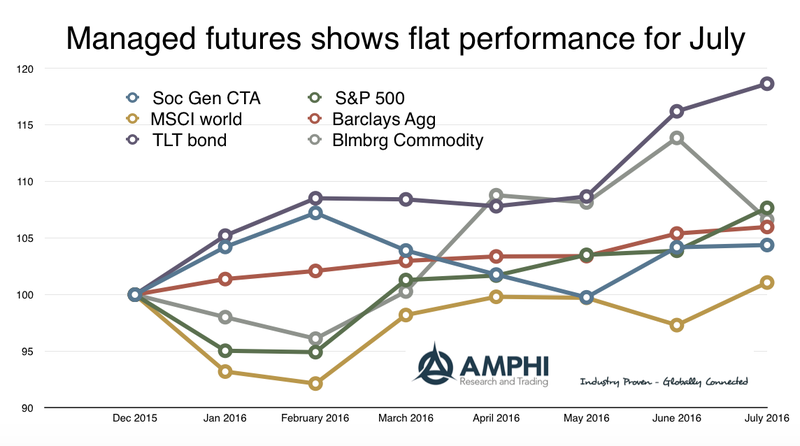 Tracking a broad set of liquid alternative managed futures funds provides good daily information on style performance. The equal weighted average of these managers showed a sell-off in the first part of July when equities started see better performance. There was a switch to risk-on behavior which traditionally has been negative for managed futures. The end of the month showed strong gains after the Fed FOMC announcement and the tapering of equity gains. Managers were able to exploit opportunities outside of equities. 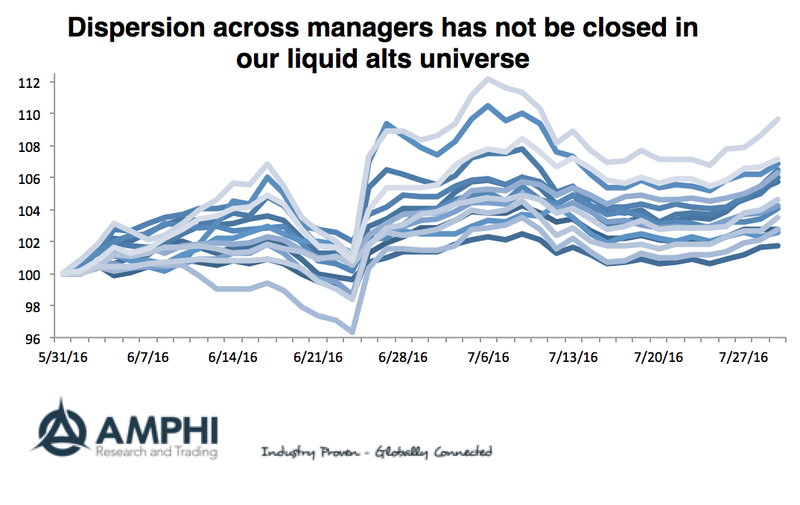 The dispersion with managers continued in July. There has been limited cross-over with performance among managers. Averaging across managers that have large dispersion and low correlation dampens the perceived value of managed futures. This dampening effect will be larger for hedge fund styles where there is more return dispersion. We have noted in other posting that we expect more dampened performance in August given the mixed sector trends. 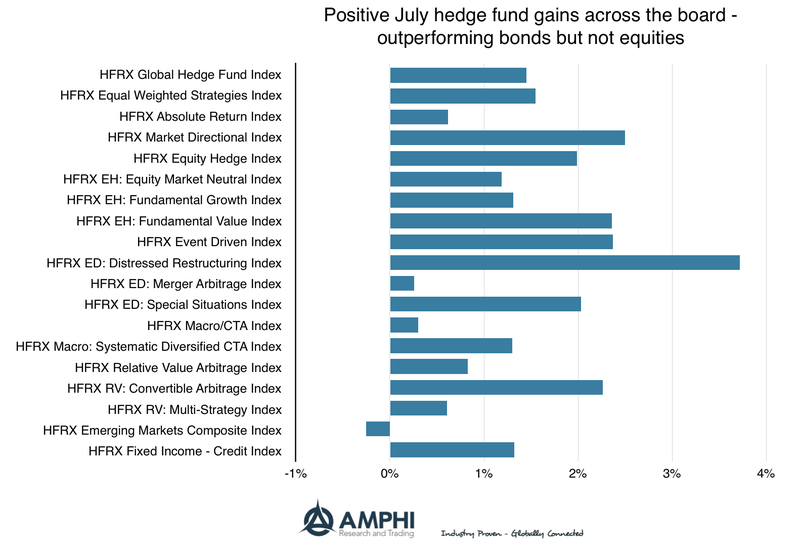 July was a good performance month for hedge funds. Given the post-BREXIT uncertainty, hedge funds were able to positively exploit many opportunities, albeit the returns generally lagged the equity benchmarks. Of course, since the market exposure beta for hedge funds is often less than .5, it should not be surprising there were lower returns than the S&P 500 in a strong up market month. Hedge funds, in most cases, did better than diversified fixed income benchmarks. In very broad terms, there is a growing view that hedge fund performance should be somewhere between these two major asset class alternatives. By that simple rule of thumb standard, hedge funds did their job. In spite of the positive gains, 2016 performance does not look especially attractive. Most hedge fund styles are below both equity and fixed income benchmarks. The lower market beta places a drag on returns and alpha production has not been great enough to make up the shortfall. 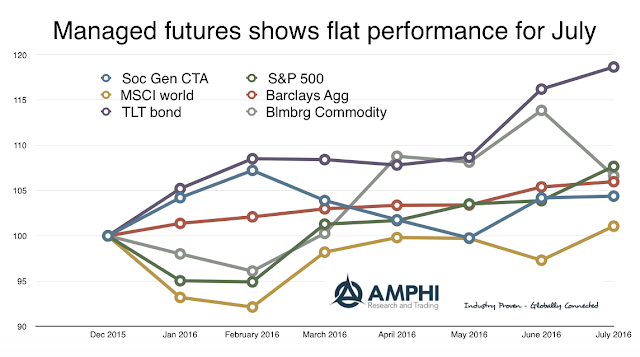 The broad Barclays Aggregate fixed income index has generated close to 6 percent returns which has bested most styles with better diversification. The S&P 500 equity index has done even better. The only outstanding strategy for the year has been distressed investing. Other strategies have not provided the value expected by investors. Of course, any seven month period is too short to make judgement on long-term allocations, but the burden is on hedge fund managers to show their skill and value-added for the remainder of the year. Market sectors seem to be more range-bound after some strong gains in the post-BREXIT environment. Whether stocks or bonds, the trends have flattened. This more sideways behavior has also carried over to currencies and precious metals. This flattening of trends is a reason for the lower returns for CTA's in July. Limited gains were achieved in the second half of the month. 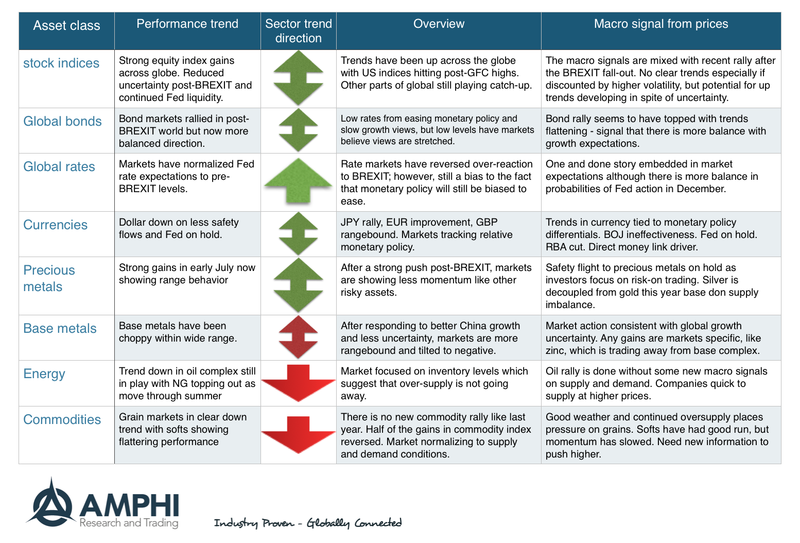 The only sectors where there are reasonable trends at the start of the month are energy and commodities and to a lesser extend global rates which are still adjust to current monetary trends. The overall view across all sectors is that this range-bound behavior will continue without some macro catalyst to change expectations. 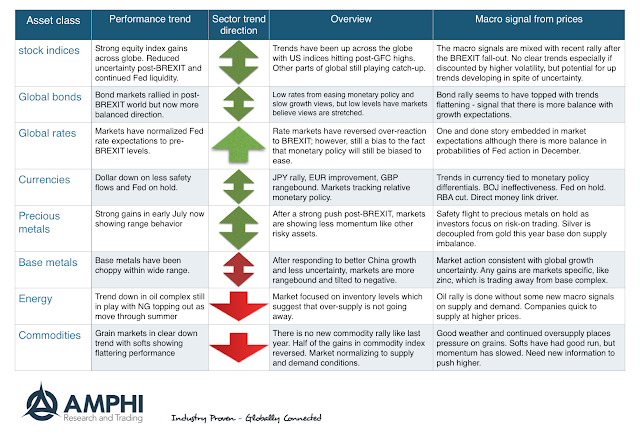 July has been a period of risk-on for many investors but the end of month price action seems to suggest that markets are stretched and need new information to break the range. 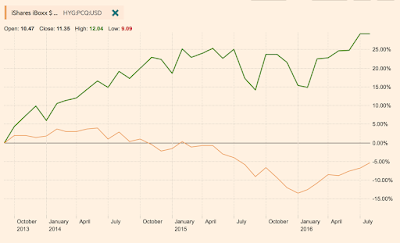 Weaker macro news has been coupled with easing monetary expectations which cause mixed trends. 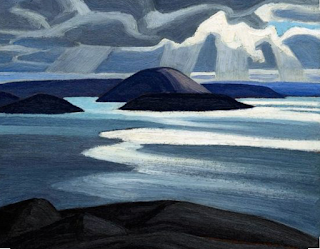 For every August where nothing happens, there are periods of dislocation; nevertheless, the trends suggest that getting a good book and reading on a beach may be more productive than watching screens. 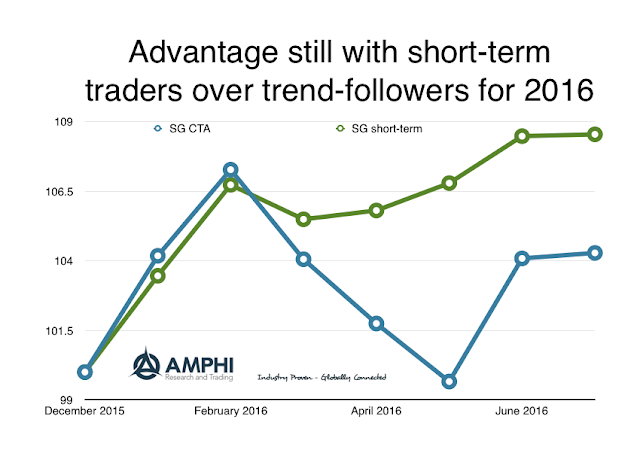 Short-term vs Trend-followers - Smooth or rough? 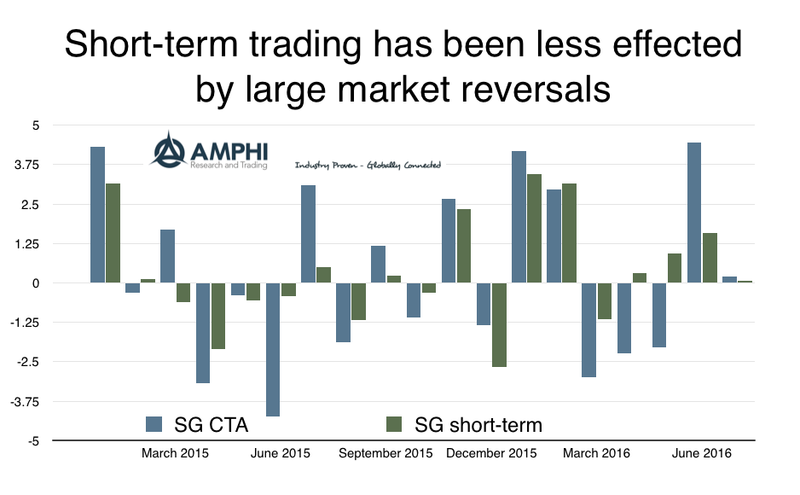 Short-term trading as measured by the SG index has continued to beat the longer-term managed futures SG index. This performance is a difference between smooth and rough trading. Short-term trading can be smoother because it should not be affected by stronger and longer reversals from key news events. The idea behind short-term trading is to exploit dislocations which may only last at most a few days and then move back to cash and await another event. Longer-term trading as often embraced by the trend-following will expect to gain more by market dislocations but also risk more before being stopped-out or reversed. By construction, these managers will be willing to wait on a short-term reversal. The short-term trader should see smoother returns while the longer-term trader will see rougher or more jagged performance. 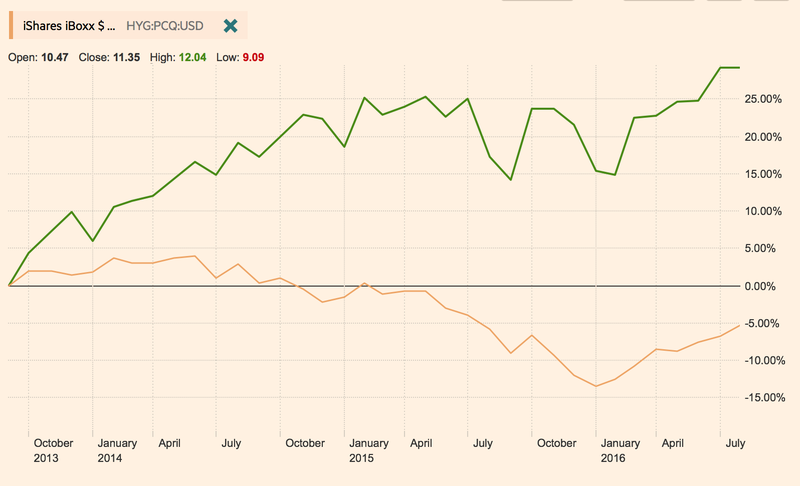 2016 is a perfect case study of the difference between smooth and rough trading styles. 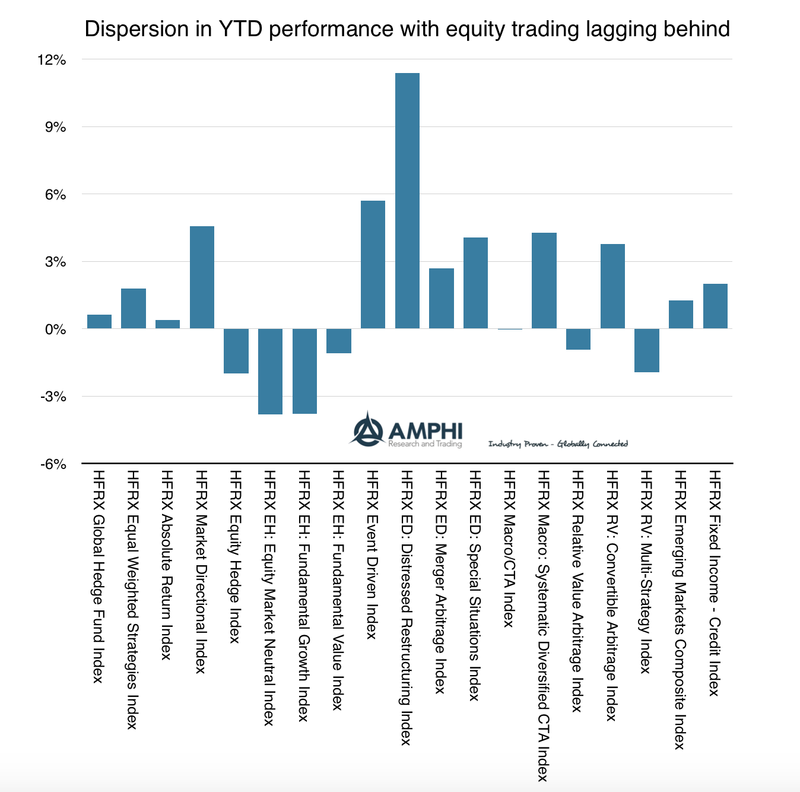 Trend-followers were able to exploit the dislocations in markets during the beginning of the year only to reverse most of those gains when the markets switched to risk-on. Trend-followers were again able to exploit dislocations surrounding the BREXIT vote. Short-term traders made money during the dislocations but turned to more passive behavior with selective trading for the periods of declining volatility. These traders did not have the reversal and kept more of their gains. What is especially valuable with these two time frame styles is the fact that they will be uncorrelated. A match between short-term and long-term will provide smoother returns overall and diversify trading risks. Managed futures as measured by the SG index posted a flat month, up 19 basis points. This was against good performance in bonds and strong positive equity gains. Commodities turned lower for the second month in a row. While not always shown statistically, we observe that after a strong event there will be a reversal or flattening of performance with trend-followers. When uncertainty is resolved, markets will reverse. Additionally, switch from risk-off to risk-on will lead to better equity performance which will not always translate to diversified managed futures. This switching will not show-up when splicing data into calendar months. Year to date returns are now fairly clustered with the outlier being the strong long bond performance. Naturally, many will have the view that just holding bonds as a diversifying assets is all that is needed in a portfolio, better returns and non-correlation. Nevertheless, even with the cluster of performance, the foundation of holding a hedge fund style that is well-diversified and looks for trends is a good way of generating unique returns even if in the short-run the end result is the same. July returns - All is good in post BREXIT world?